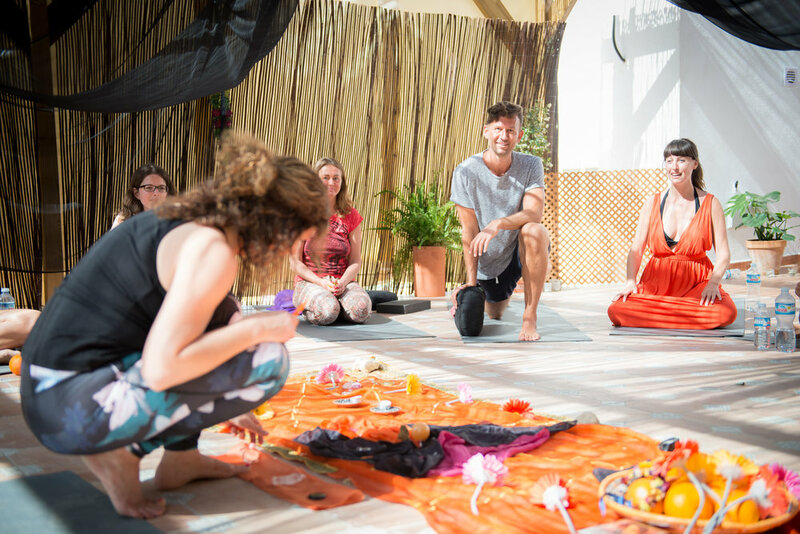 The Healing Tents Retreat in Spain is a 7-day journey into the core of sacred feminine consciousness through supported circles, deep energy work & ritual. On this week, you will re-enter the ancient mysteries of the goddess surrounded by the wild, beautiful nature of Andalusia in Southern Spain. For more information on Sophie's Retreat Programme and the Booking process, please go to the page "On Retreat With Sophie"
Many participants of Sophie's Retreats describe them as life-changing experiences. It is not essential to have previous experience of retreats or workshops to be a part of this week. What is vital is a willingness to open up to an encounter with your Soul that may stretch you. These events are designed to take you into new levels of intimacy with your Self and others. Many retreat members find that they create very deep bonds, and heal fears around openness, trust and connection. The deeply intuitive nature of Sophie's work means that each day is different, and rooted in her established connection to the Divine. This allows Sophie to be a channel for a pure flow of spiritual gifts which are tailored to each participant, as well as deeply supporting the group as a whole. Within a clearly-defined daily routine, you will receive a cornucopia of spiritual and healing content. 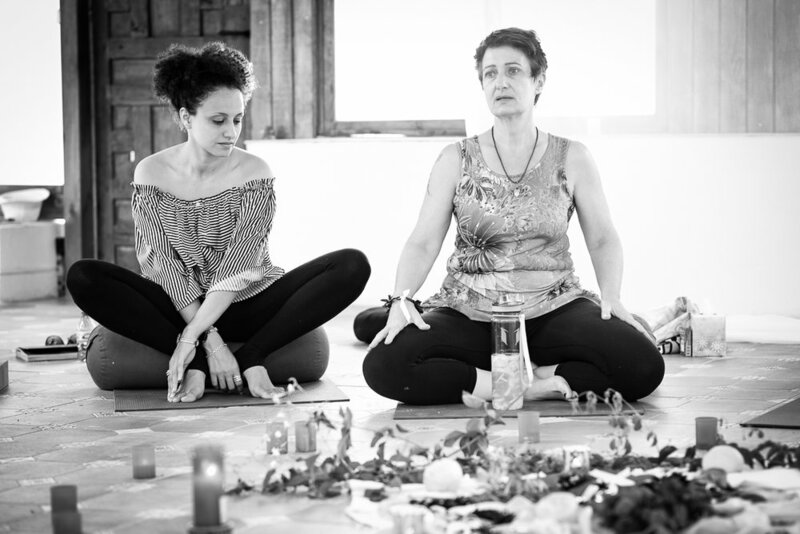 The sessions comprise techniques such as guided meditations, supported & therapeutic sharing, specific Divine Attunement from Sophie's guides and much more. Each day, you will take part in a morning and afternoon session led by Sophie, held in the recently built yoga shala. There will be plenty of time during the week, to relax and integrate the work done in sessions. Early morning meditations & evening social times are optional. You will eat your nourishing home-cooked meals with the group, in the beautiful outside dining terrace of the Main House. On one of the days there will be a Relaxation Day, with a reduced session schedule and an option of a group outing to a local place of interest. There will also be an optional beach trip. "If you are a man on the spiritual path wanting to evolve into the next level of your purpose and beyond, I thoroughly recommend attending one of Sophie's retreats. Follow your instinct and take the step into this unknown, beautiful love...it will awaken your heart, your soul and your senses!" These prices are all-inclusive of accommodation, all meals and retreat session work. They do not include flights, transfers or excursions. All accommodation is in large, twin-bedded, ensuite rooms (Main House) or apartments with kitchen, lounge and private terrace (Cortijo). Rooms are not mixed gender. Double and single rooms are limited and are not allocated on registration. If you have a special request for a single room, we can consider this, however we cannot guarantee single-room availability. If a single room is allocated there is a supplement. The retreat venue is in Almeria, one of Spain's sunniest and least visited regions. It is on the edge of one of Europe's most remote and beautiful natural parks, the Cabo de Gata, one of the last unspoiled stretches of Spanish coastline. Within walking distance to the local village, the venue is situated in a peaceful, isolated location. It is only half an hour from Almeria airport. The main house of this stunning new yoga venue has won awards for it's striking modernist design. It sits in the semi-desert landscape amidst lush gardens, it's architecture echoing ancient Mediterranean civilisations. It's natural swimming pools are fed by spring water, and filtered by reed beds. It has long been a stylish, bohemian family home, also an exotic venue for photo shoots. It has now been adapted to cater for retreats and yoga holidays. The accommodation on this retreat will be in both the Main House, and the outlying cortijo, or farm. The cortijo has been converted in the local style into charming apartments, located a couple of hundred yards from the main house. The Cortijo has it's own pool, and and a covered, newly-built yoga/retreat group space. "My life and my whole being have been changed. Thank you for creating this safe, solid, sacred space." "I opened to something so special and magical, and since then things have continued to evolve daily." "It truly was an honour to spend these days with Sophie." "I am reborn. Completely brand new." Bridget, the Retreat Manager will be on hand to assist you with your travel and other practical arrangements for attending this retreat. The nearest airport is Almeria (LEI) and is only 30 minutes from the venue by car. We are used to assisting participants travelling from the US, the Far East and Australia. Plenty of information regarding the venue and the retreat itself will be given to you once your place is confirmed. You'll be supported throughout the process leading up to the retreat itself, and will also have the opportunity to connect with the other members of the group well in advance. Photographs by Marijke Thoen 2017. Subject to copyright. © Sophie Bashford 2018. All Rights Reserved.